I feel like writing a short review today, so just go with me on this one. 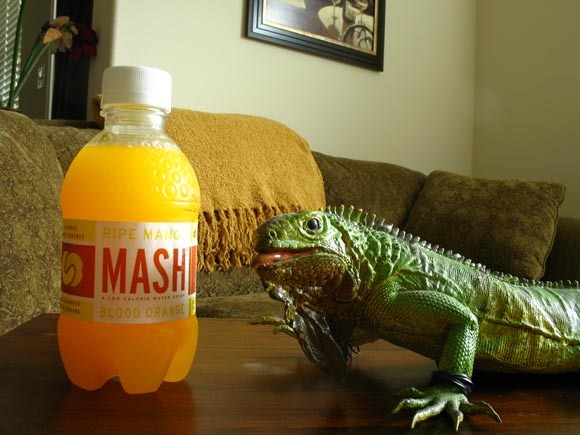 MASH Ripe Mango Blood Orange is the third MASH drink up for review. The other two were pretty good, but not spectacular. MASH is pretty much two steps above fruity carbonated water. If this is anything like the other two flavors then one flavor will dominate as the other sits quietly in a corner. My guess is that the mango will play the role of the dom. Onward! I seem to be on the right track thus far as the most noticeable aroma that escapes is… bum bada buuuum… the mango. I bet each of you 1,000th of a cent that the flavor will match the scent. Cent for scent… I’ve mildly amused myself. Well I owe you a collective cent. While the mango jumps in at the end of this taste test, the blood orange is featured first. This marks the first time the two flavors have both been represented equally, but I’m not overly thrilled with it. For whatever reason the two flavors clash a bit with my tongue. Instead of a fresh citrus flavor it’s somewhat bitter. Maybe I got a bad batch or something, but this isn’t my style. The bitterness sits there throughout not allowing me to fully enjoy either of the two flavors I normally would. With that said it also takes away how refreshing the drink should be, which is sad since the previous two drinks were quenchers of thirst. MASH Ripe Mango Blood Orange is very…yeah. Faux fact: Twist isn't ripe yet, that's why he's green.